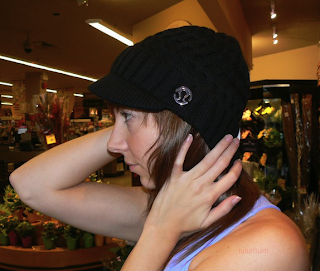 I’m liking the brimmed toque in black. CRB Very Violet. Initially I didn’t like this one because of the double side colors but two things are making me reconsider. I really like the feel of this CRB compared to the others. It feels a lot like the Lilac Inspire Pullover in it’s thinness and it’s not quite as static as some of the other colors that have come out. I like that on the back where it’s solid Very Violet it’s edged in static Very Violet so there is a good visual transition between the two textures. Ok a third reason is because I got the Very Violet Brisk Ear Warmers that are trimmed in black and I love that combination. The color looks fantastic on brunettes so I think I need something that I can wear with because other then black and greys I’m not finding too much in my closet that matches it. The Teal Zeal looks ‘good’ with it but sort of skiddles-ish (as my friend likes to say) so although they look pretty next to each other in the closet I don’t think I can pull of wearing them together out. The Express Yourself Wrap in Wish Blue is so lovely but I’m really unsure on the shape of this wrap on me so I need to try it on today. I also don’t love the Cashmere Rayon blend. It’s plenty soft but I’m just not gentle enough with my cardigans and I’m sure I would get major pilling on this. I have a few silk cashmere cardigans that I’ve worn to bed during the winter so that should give you an indication of how much I ‘love’ my clothes.